Keep the music on and your phone off with the lightweight Clip Sport Go MP3 player that’s designed for your workout. Supporting iTunes and other audio content, its high-performance dynamic acoustic quality makes almost any activity a richer experience. And because it clips on easily, it’s perfect for the way you move. 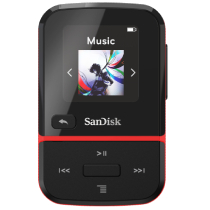 2Based on continuous playback at 128 kbps MP3; actual life and performance may vary depending upon usage and settings; battery not replaceable.